The weekly chart of World Wrestling Entertainment (WWE) has gone hyperbolic. The stock price has diverted widely from its 40 week moving average. 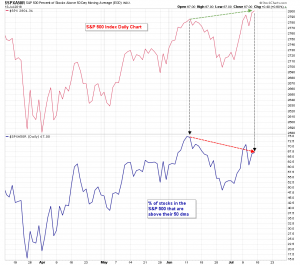 On the daily chart the 50 day average is over 40% higher than the 200 day average. These diversions are the most in the history of the stock price. It’s impossible to say when a reversion to these means will occur but when it does it could be swift and volatile. It is important for those long WWE or those looking to enter from the short side to be vigilant for early warnings signs. One such warning sign may have appeared on the charts this week. 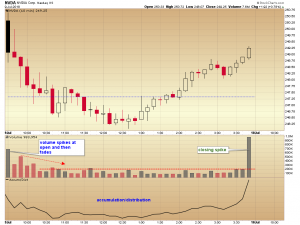 A large doji candle formed on both the daily and weekly time frames. These particular candles are called long legged dojis because their narrow opening and closing range is situated near the middle of a wide overall range. Doji candles suggest investor indecision because the stock saw a lot of movement both higher and lower after the open, but it finished the session by closing exactly where it started. These dojis often mark the tops of sharp rallies and are very often associated with blow-off tops. 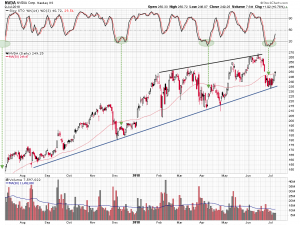 Initial confirmation would require a break below the two month uptrend line on the World Wrestling Entertainment daily chart. Shorts should use tight disciplined stops because a stock with this type of upside momentum won’t go down without a fight. The S&P 500 Index Has Been Hijacked By Big Tech! The S&P 500 Index has been making a well-defined series of higher highs and higher lows, since it bottomed in early April. 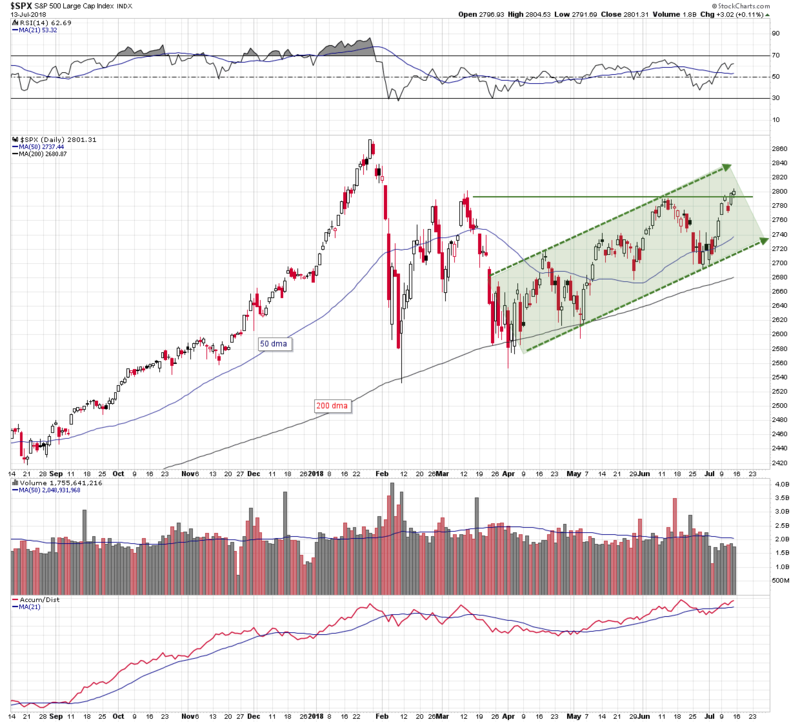 A very bullish looking rising channel pattern has formed on the daily chart. Friday’s close took out the February high, the relative strength index is tracking higher, volume is light but the direction of money flow is positive. It appears to be all good and perhaps it is. There is one troubling aspect, however, not so much of the chart but of the index itself. These three companies are responsible for 70% of S&P gains from CNBC. 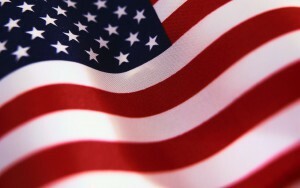 The influence of several big technology names is, to a large degree, determining the direction of the broader market. Now take a look at the number of stocks in the S&P 500 that are above their 50 day moving average. When the S&P made its June high about 75% of the stocks in the index were above their 50 day average. 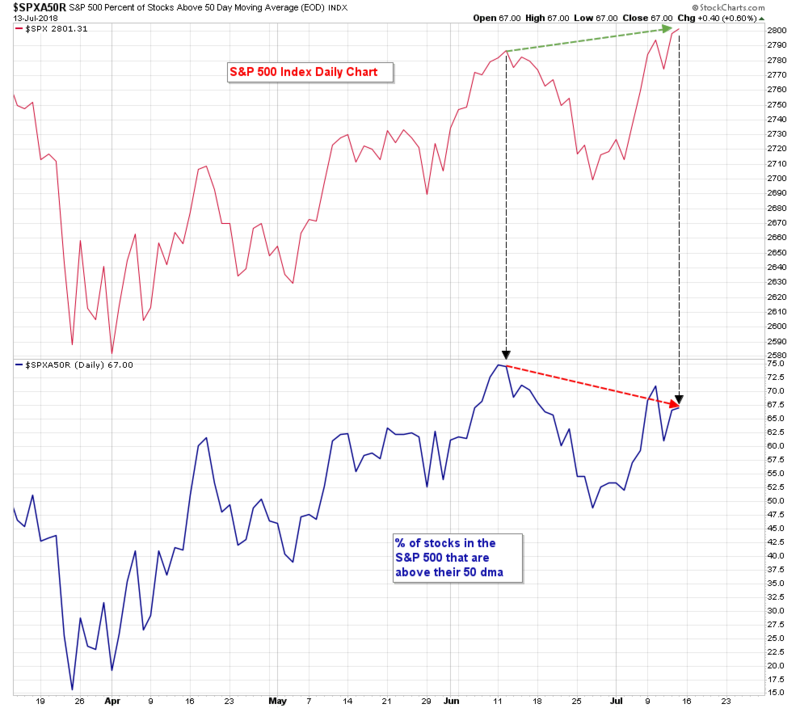 But when the index made a higher high last week, only 67% of the stocks in the index were above their 50 day average. This is a 10% divergence. The takeaway is that several big tech names have hijacked the broader market. All will be well as long as they can handle the load. The converse is also true. If one of these names should falter, the entire market is vulnerable. There is a 20% outstanding short interest in shares of Party City Holdco, a speciality retailer that provides party supplies. This is usually not a good fundamental sign. Short sellers are very often right about a stock. 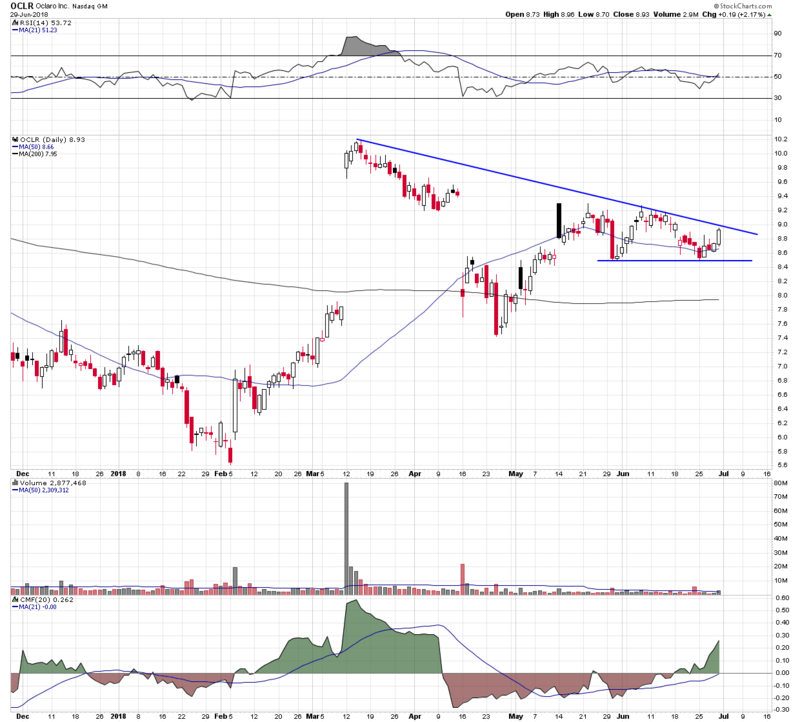 But when the stock has been under consolidation for a while and looks like it is poised to break out of a technical pattern, then a large short interest can be a good thing for traders. It can power the classic short covering rally, when weak holders rush to cover their short positions and consequently the stock rallies. 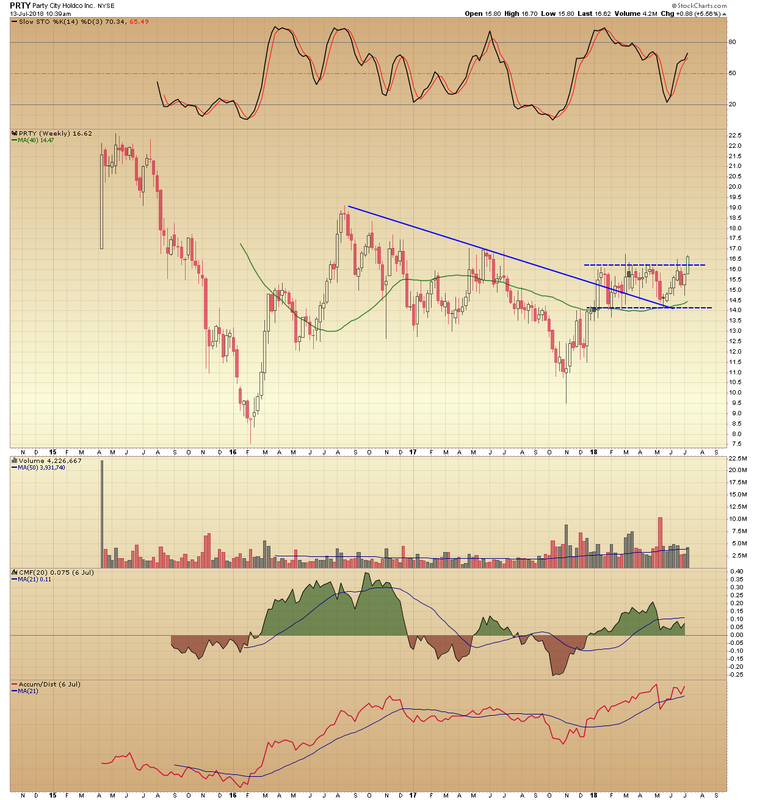 On the Party City weekly chart the stock can be seen breaking above a long term downtrend line that marked the 2017 and 2018 highs. Shares then began trading in a horizontal channel pattern delineated by resistance in the $16.25 area and support at $14.00, just above the 40 week moving average. The stochastic oscillator is moving higher reflecting an increase in positive momentum, but more importantly are the money flow readings. These indicate an increase in investor interest in the stock this year and accumulation. 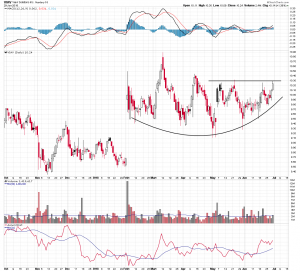 On the daily chart it is clear that Party City is in the process of breaking out. The long short-squeeze trade is a speculative one designed for a quick profit or a quick loss. Protecting capital is the prime directive. 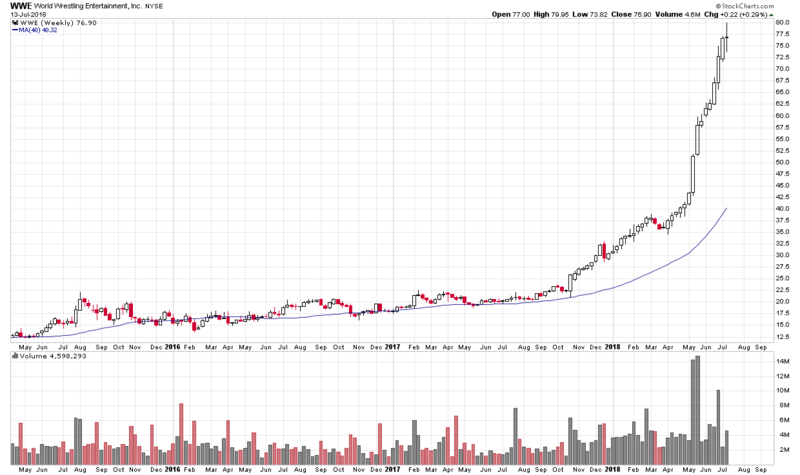 Docusign (DOCU) became a publicly traded company 53 trading days ago. The e-signature software provider made its May debut at $38 and then rallied sharply, to a $64 closing high the following month. After making its June high, however, shares quickly reversed direction and in just the next two weeks, retraced 50% of the initial 68% gain. This took the stock price back down to the $52 area which is also the current location of the newly tracked 50 day moving average. At this nexus of 50 period technical point in both time and price, a bullish candle pattern has formed called a morningstar pattern. A morningstar is a three period pattern consisting of a large down-day candle, followed by a narrow opening and closing range “doji” candle, and completed by a large up-day candle. It reflects a transition in investor sentiment from bearishness-to-bullishness, and often marks important lows in price. In addition, there was strong positive volume and money flow in Thursday’s session and the stochastics oscillator has moved out of an oversold condition. 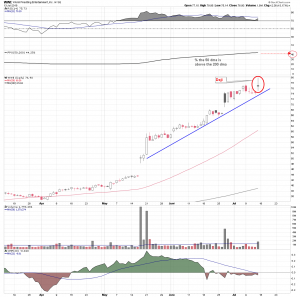 Docusign is a good risk/reward long trade at its current price using an initial percentage stop under the 50 day moving average. 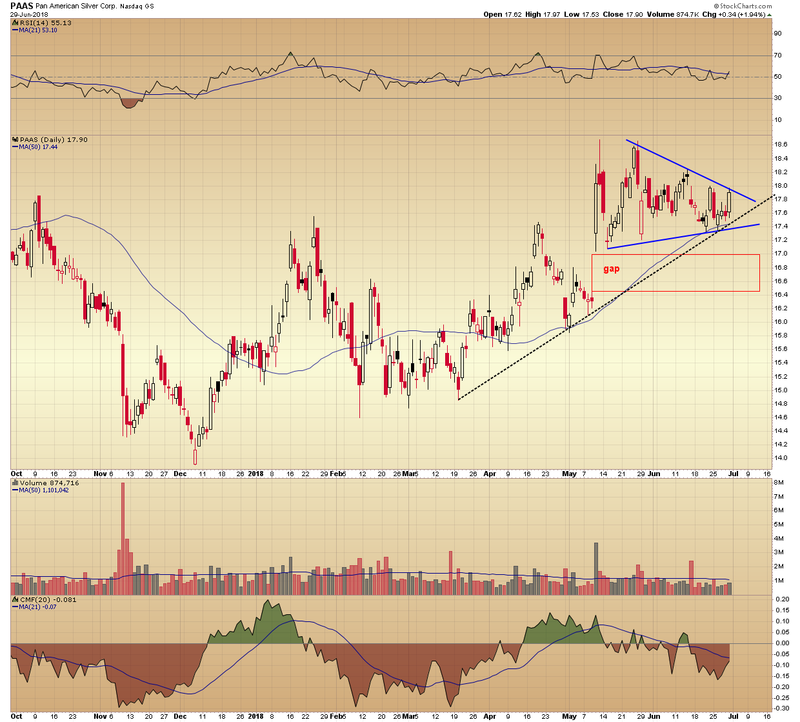 NVIDIA (NVDA) shares gapped lower at the open on June 25th, taking the stock price back below the 50 day moving average. It traded under the average but above a nearly one year uptrend line for the next nine days. 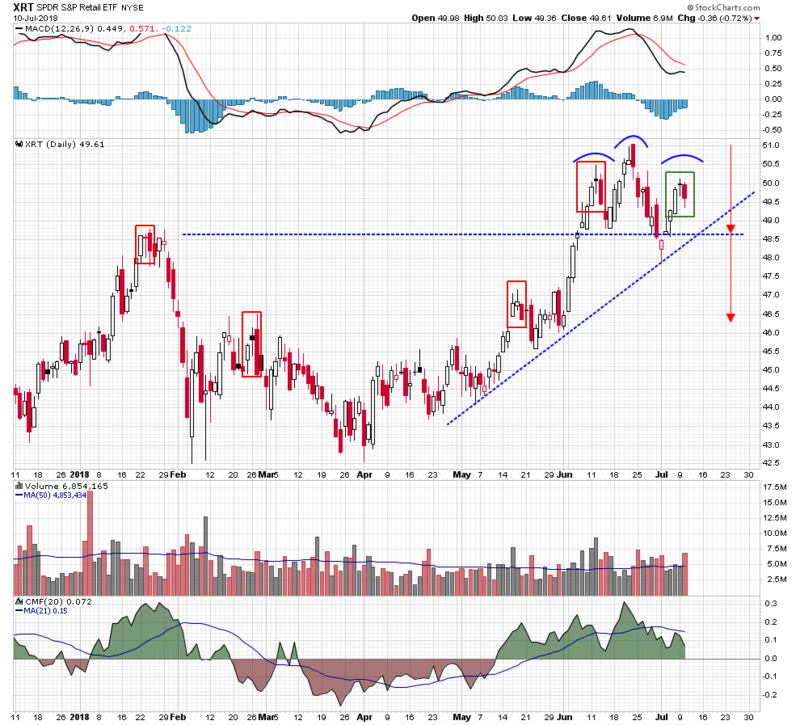 On Monday NVIDIA shares gapped higher at the open, leaving behind the nine day consolidation channel and recapturing the 50 day moving average. 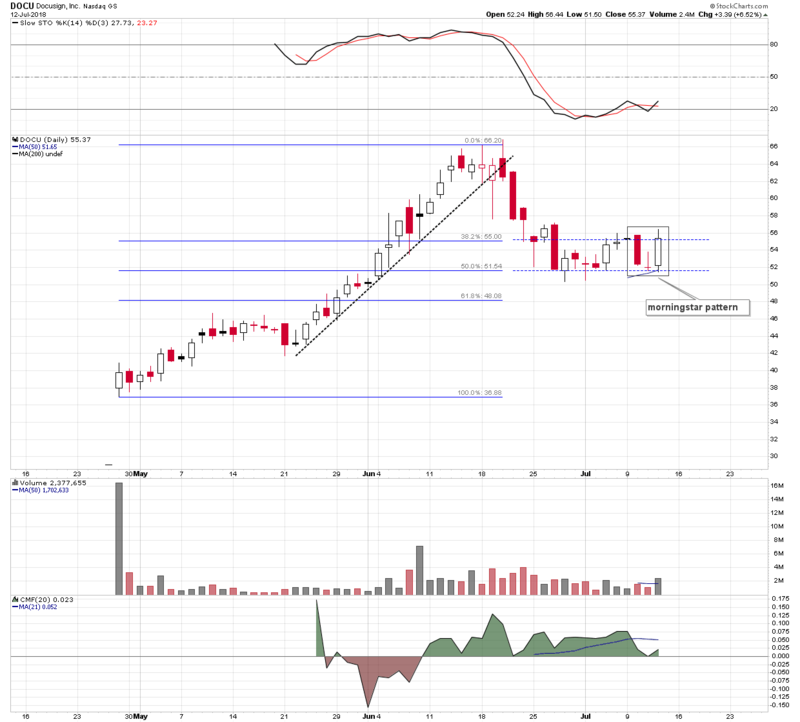 It looked like the price action had formed a bullish island reversal on the daily chart. As it turned out, the downside gap was closed in the first hour of trading and the stock continued to weaken into mid-session. In the second half of the session NVIDIA shares strengthened and closed near their highs, and just above the 50 day moving average. So, while the gap higher did not hold and the island reversal was negated, today’s price action did form a small bullish hammer candle. 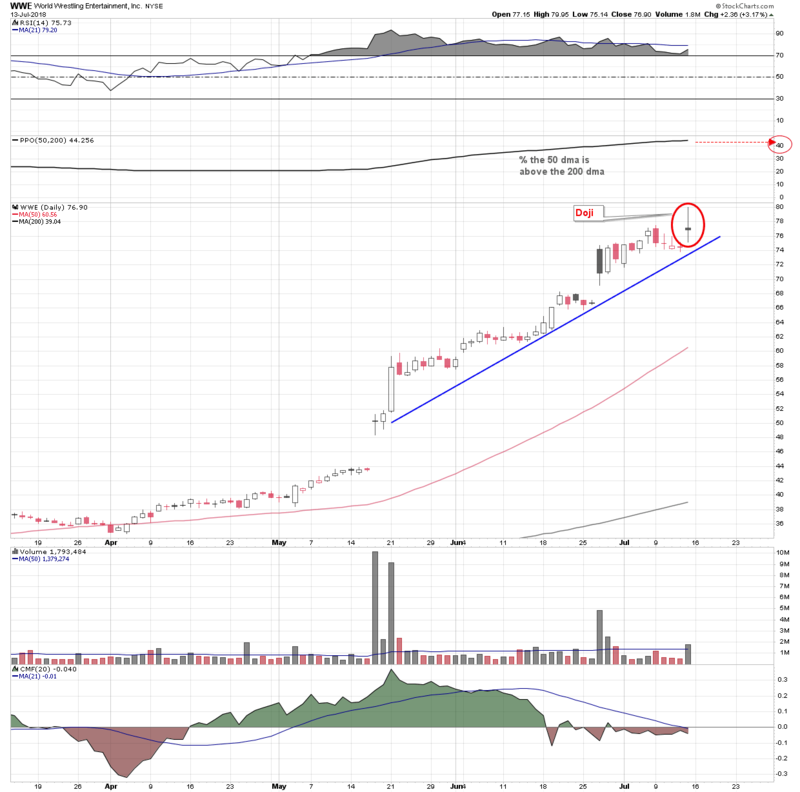 The nine day consolidation above the long term uptrend line should be a base for an upside move that could retest the rising triangle on the daily chart. That said, there was something unusual about the behavior of the semiconductors and technology shares in general in the first half of the session, and consequently when they did an about face and strengthened in the second half of trading. 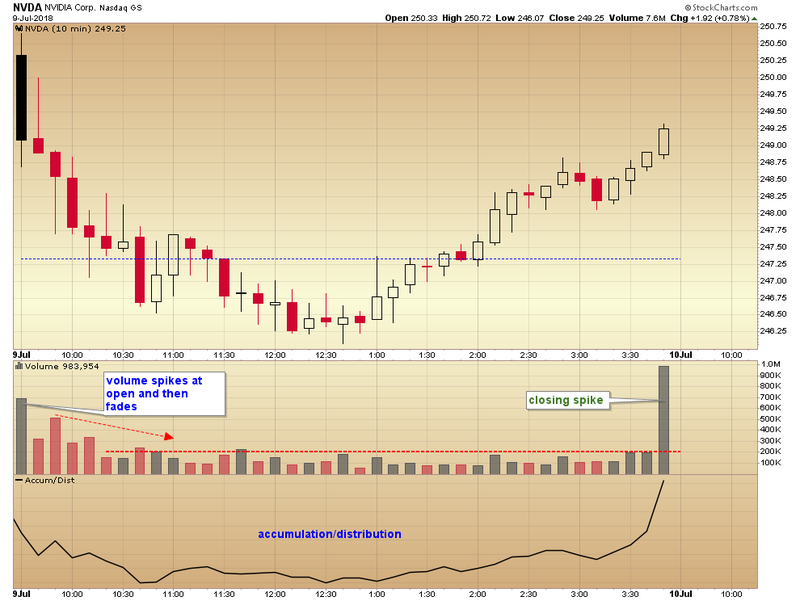 On the ten minute NVIDIA chart volume can be seen spiking on the gap open. But the enthusiasm quickly faded and the accumulation/distribution line suggests the opening buying then turned to selling. Volume was heavy in the first hour of trading but that moderated, along with money flow. Even as the stock price began to strengthen volume remained muted and didn’t pick up until the last half hour of the session. 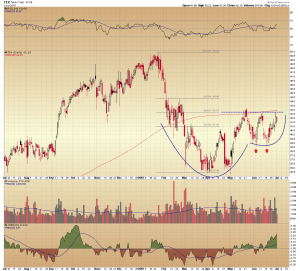 Clearly the price action as reflected on the NVIDIA daily chart remains bullish. 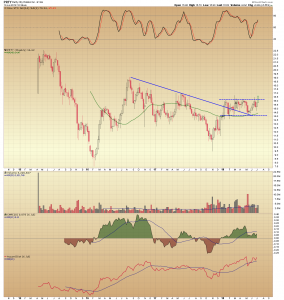 A long term trend line was successfully retested and a major moving average recaptured in the process. The internals of one half-session should not distract from the bigger picture. But should the technical dynamics shift, the well-defined levels of chart support afford comfortable levels at which to place stops. 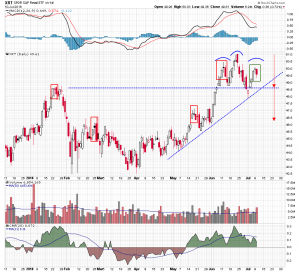 The price action on the NVDIA (NVDA) chart over the last several weeks has been very constructive. 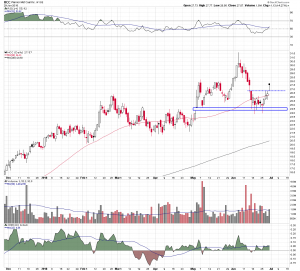 The stock has been consolidating above a nearly one year uptrend line, and now it looks like it is breaking out. 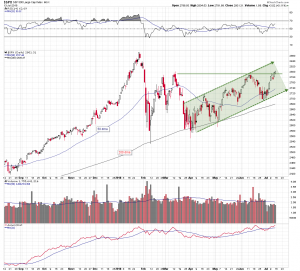 The first chart shows the consolidation in the form of a small channel pattern, situated between 50 day moving average resistance and the uptrend line support. NVDIA became oversold after its early June drop and now the stochastic oscillator is making a bullish crossover and moving out of its oversold zone. One concern, however, is volume. 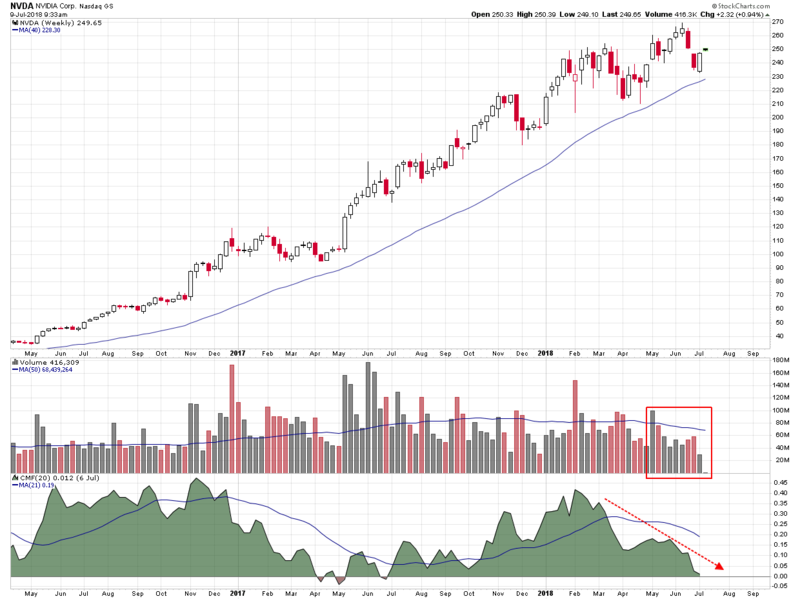 The weekly chart shows the steady decline in volume and positive money flow this year. But there have been similar periods of volume and money declines that have had little effect of the trajectory of the stock price. 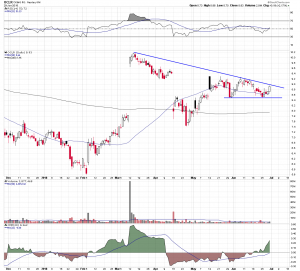 NVIDA gapped open this morning above its 50 day moving average. If this remains the low for the session it will have established an island bottom at support. The island is the recent consolidation period delineated by the gap lower and below the 50 day average, and the gap higher and above the 50 day average. 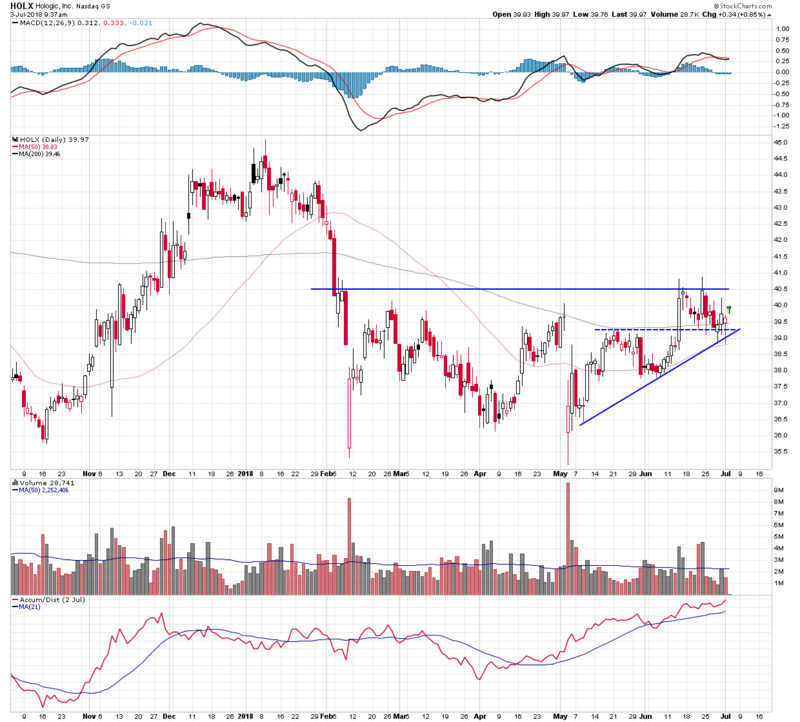 This would suggest higher prices and a retest of rising triangle resistance. Terex (TEX) is an industrial and farm equipment manufacturer. It’s stock price dropped sharply in the first quarter of the year, but for the last three months it has been recovering. 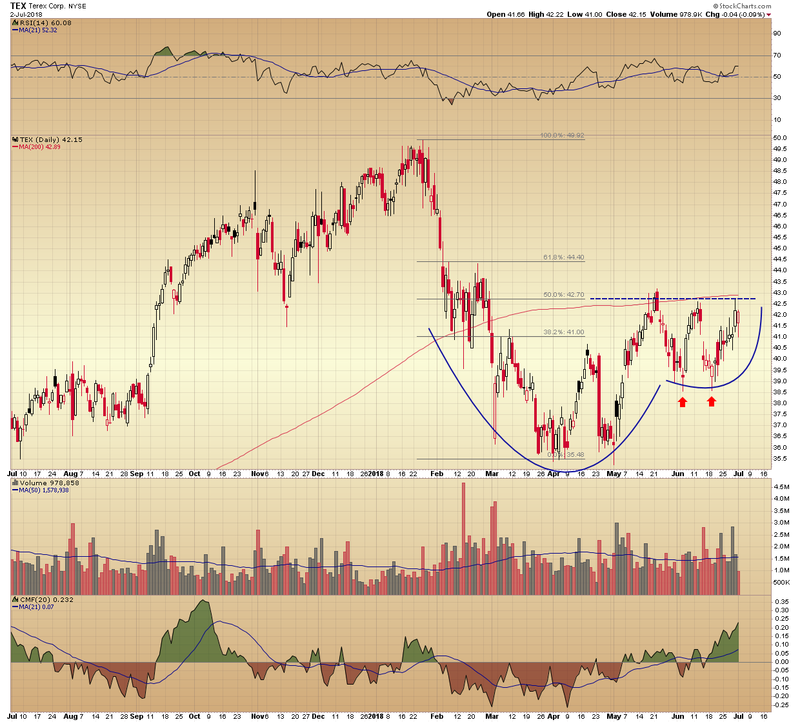 The process of decline and recovery looks like a large cup and handle pattern. 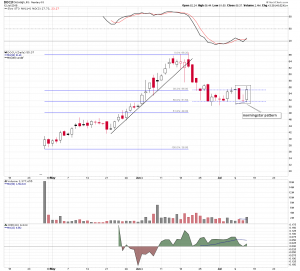 Rim line resistance is situated at the 50% retracement level of this year’s range and the flat 50 day moving average. 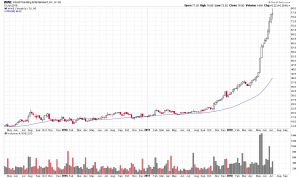 Since making a May low, Hologic (HOLX) has carved out a series of higher highs and higher lows. 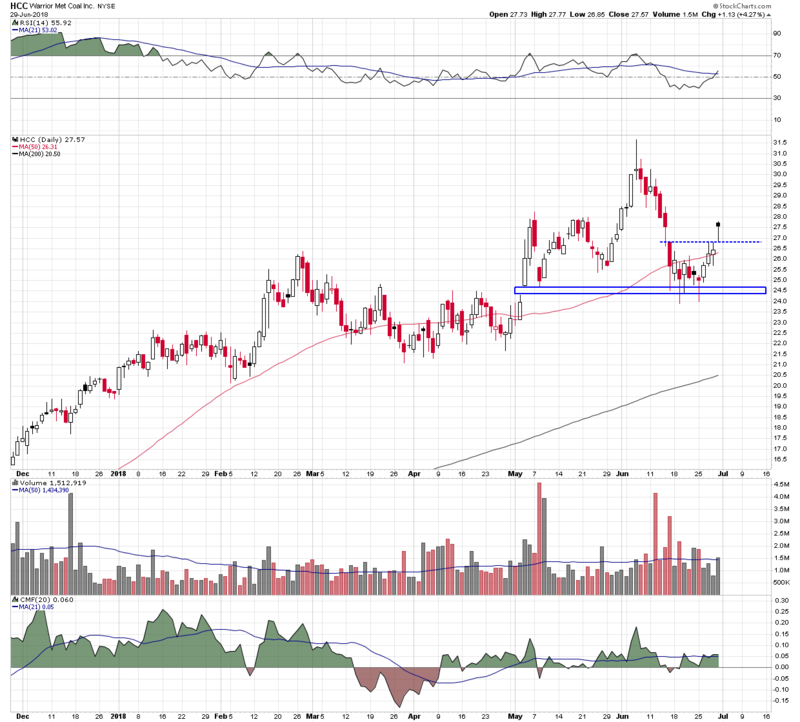 With well defined levels of support and resistance, it looks like a good risk/reward trade. Here are four potential long trades going into a trading day that is following a decidedly down pre-market session. First up is the semiconductor company Oclaro (OCLR). It has held support above the $8.50 level and looks like it wants to break above the downtrend line drawn off the highs of the last four months. Next is Pan American Silver (PAAS) which has formed a rising triangle on its daily chart. 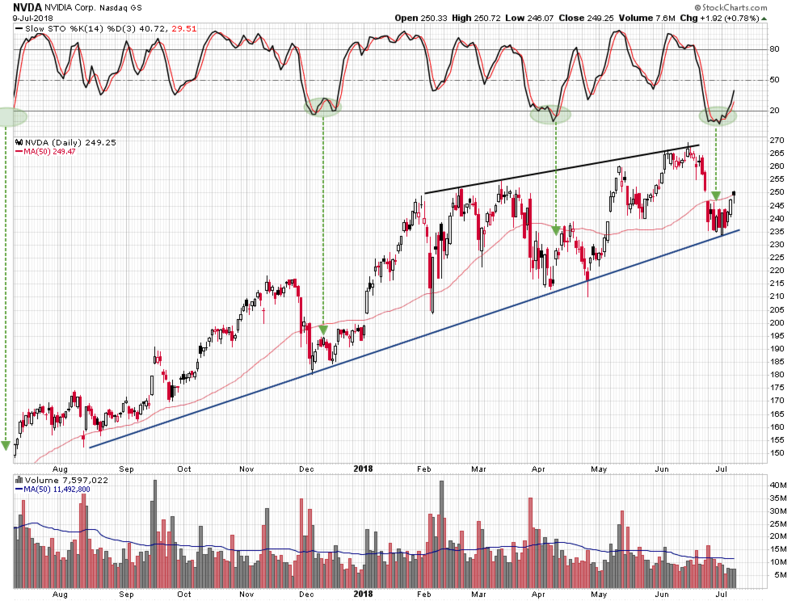 Last week the stock successfully retested its 50 day moving average and the three month uptrend line. 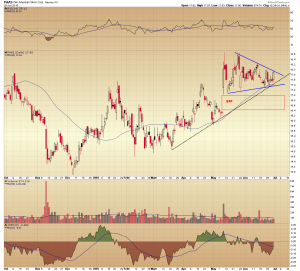 Now its is testing triangle resistance. 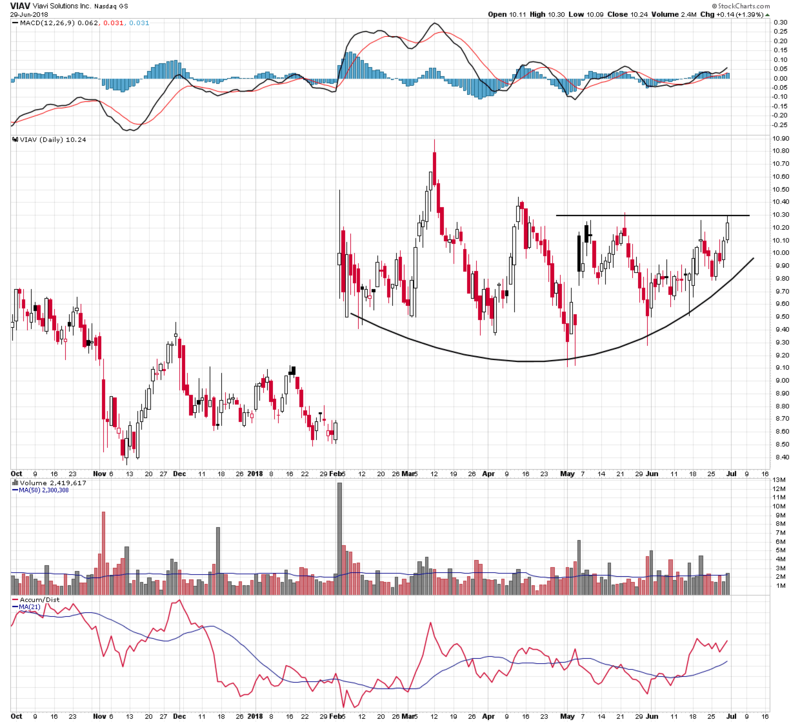 A rounded base formed on the chart of Viavi Solutions (VIAV), a telecom equipment supplier. Resistance is clearly defined at the $10.30 level. Finally, a coal miner made the list. 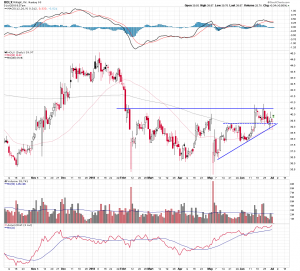 Warrior Met Coal (HCC) made a decisive break above resistance in the Friday session. Old resistance becomes new support.